Seventy years after its founding, the Strathmore Paper Co. ceased to exist as a stand-alone business. In 1962 it was acquired by the Hammermill Paper Co. of Erie, Pennsylvania, run by ex-Strathmore executives. However, the company continued to operate independently and from 1964 through 1972 its promotional activities experienced a creative rebirth. 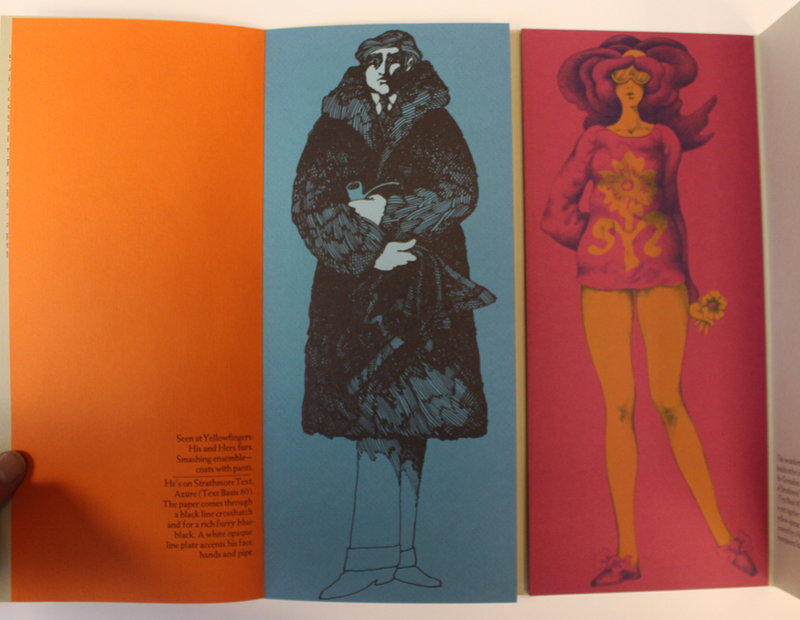 Although the “Strathmore Expressive Printing Papers” campaign had come to an end in 1960, Strathmore discovered a new generation of outstanding designers to create its sample books and direct mail efforts. During this period Strathmore’s promotional mailings reflected the parallel trends of the “Push Pin Style” and Swiss modernism (see Paper Is Part of the Picture no. 25). 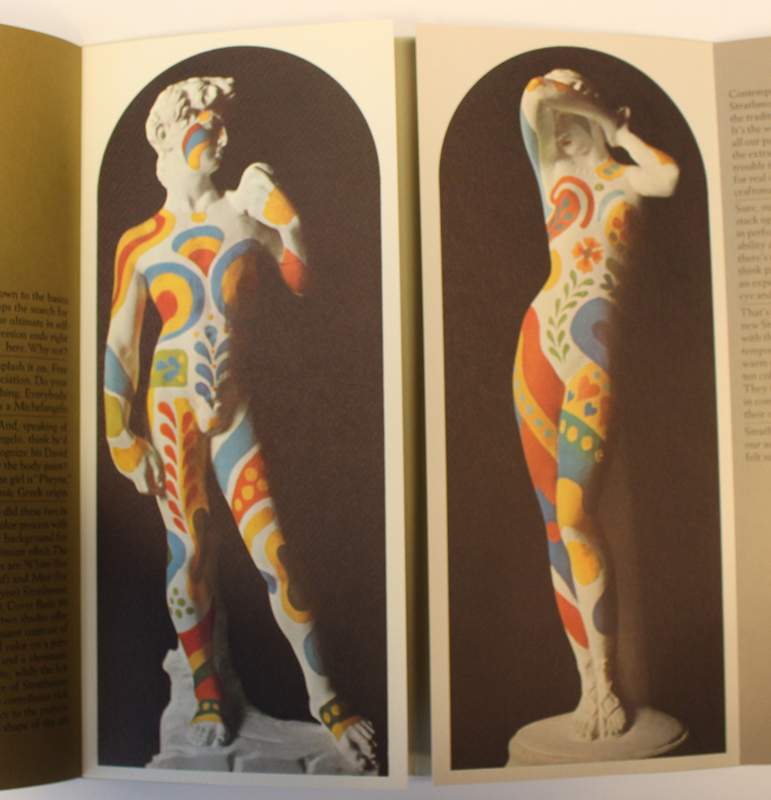 The designs by Milton Glaser (b. 1929), Seymour Chwast (b. 1931), Isadore Seltzer (b. 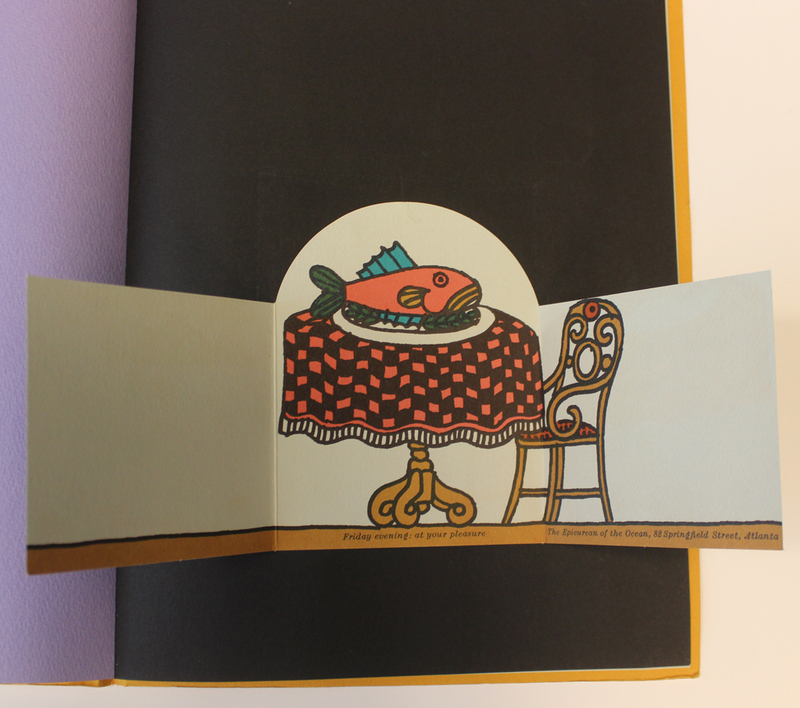 1930), John Alcorn (1935–1992) and Simms Taback (1932–2011) represented a renewed interest in making paper part of the picture, but this time with die-cuts, gatefolds and other finishing techniques that physically brought paper into a design. Push Pin Studios was founded in 1954 by Cooper Union classmates Milton Glaser, Seymour Chwast, and Ed Sorel (b. 1929) with Reynold Ruffins (b. 1930) joining soon thereafter. The four men were all illustrators first and foremost, and designers second. They shared an interest in older, often discredited styles of design and illustration such as Victoriana, Art Nouveau and Art Deco. They often mixed these influences together with references to art history and pop culture to create surprising designs that were an antithesis of the modernist trend then in vogue in 1950s America. Their collective work was marked by playfulness mixed with seriousness. It often reflected an interest not only in art, but in literature, psychology and politics. All of these influences came together in the studio’s long-running promotional vehicle The Push Pin Graphic. How should we do for drinke? How should we do for sack’a? How should we doe for songs? 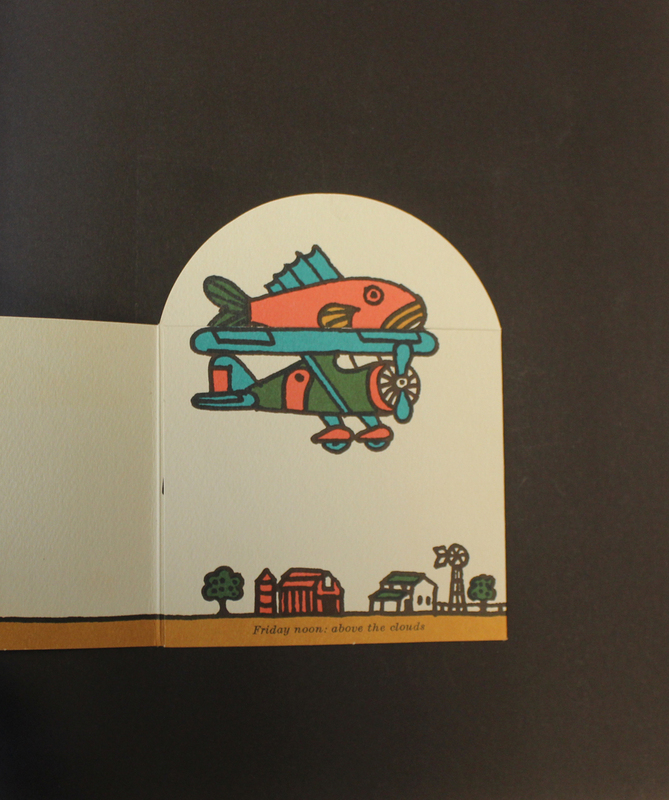 The promotion contains flaps that open in one instance to show the interior of a cigar box and in another to track a fish from sea to plate with an airplane ride in between (a real flying fish); and a cheese grater with die cut holes that hide a sore throat remedy. “The world of the designer and the printer is in many real ways a world of paper,” the Push Pin designers wrote, “Paper is the surface with which we work; the texture, color and character of the paper become part of the final piece.” With “If All the World Were Paper” they brought back the richness of Strathmore’s 1920s Paper Is Part of the Picture famous artists campaign. 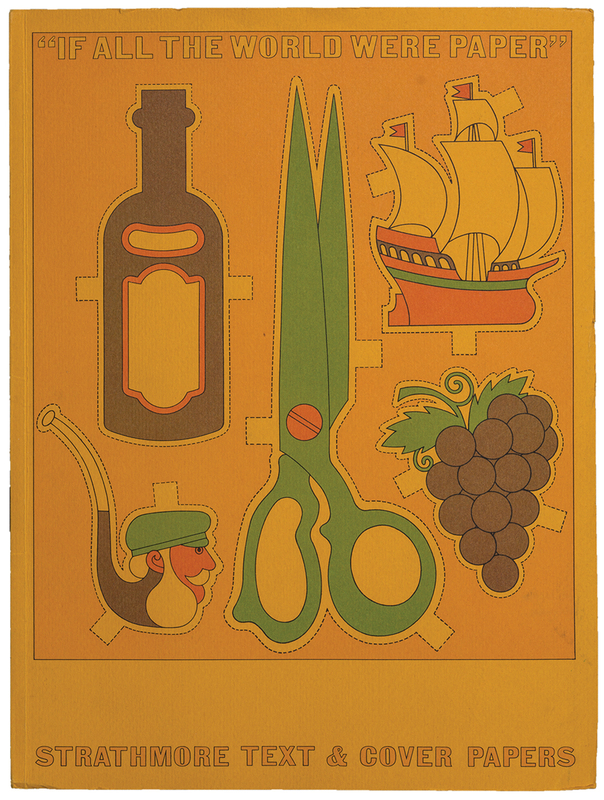 Closed illustration from “If All the World Were Paper” promotion (Strathmore Paper Co., 1964). Design by Push Pin Studios. 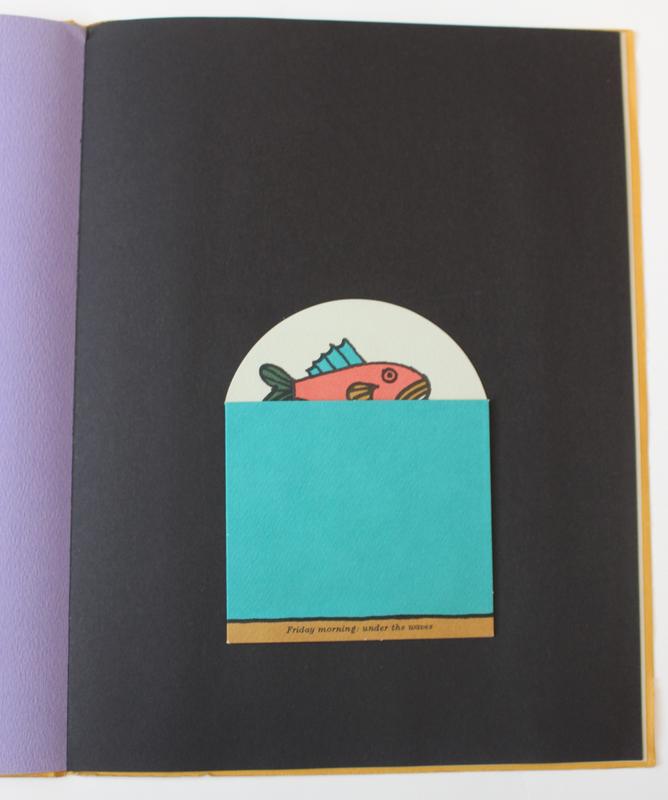 Partly opened illustration from “If All the World Were Paper” promotion (Strathmore Paper Co., 1964). Design by Push Pin Studios. Fully opened illustration from “If All the World Were Paper” promotion (Strathmore Paper Co., 1964). Design by Push Pin Studios. An even more interactive promotion was created five years later by John Alcorn, who was a member of the Push Pin Studios from 1956 to 1958. Fashion Forecast: Strathmore Text! is a pure artifact of the 1960s. Its cover is unassuming with a row of four colored buttons, but once opened it becomes a series of paired men’s and women’s fashions of the day (bell bottom pants, rose-colored glasses, miniskirts, thigh-high boots) that culminate in irreverently, psychedelically colored versions of Michelangelo’s statue of David and a Greek statue of Phryne (a 4th c. courtesan). Cover of Fashion Forecast: Strathmore Text! promotion (Strathmore Paper Co., 1969). Design by John Alcorn. Photograph by Ariel Smullen. Interior spread from Fashion Forecast: Strathmore Text! promotion (Strathmore Paper Co., 1969). Illustrations by John Alcorn. Photograph by Vincent Giordano. Interior spread from Fashion Forecast: Strathmore Text! promotion (Strathmore Paper Co., 1969). Illustrations by John Alcorn. Although Simms Taback was never a member of Push Pin Studios, his illustrations share some of the same sense of humor and fun that characterized its work. 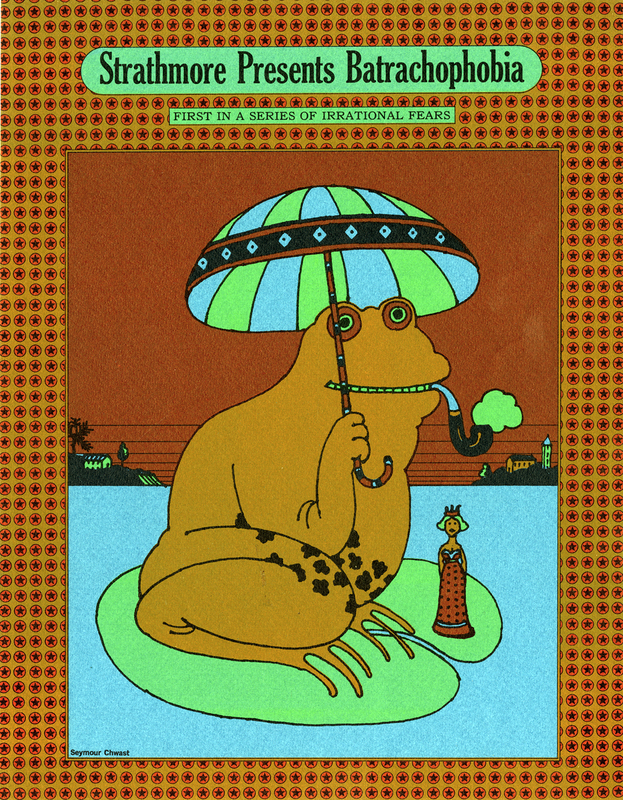 Better known today as an author and illustrator of children’s books, he was a commercial artist for many years as well as a graphic design activist. For Strathmore, Taback worked on a campaign called “Are you afraid of Strathmore?” in 1968. The “Are you afraid of Strathmore?” campaign consisted of promotional mailer sheets , which also appeared as magazine advertisements, along with an untitled booklet. It was a reprise of the 1930s Staple Papers campaign that sought to reassure printers and designers that Strathmore was an affordable paper option, despite its longstanding emphasis on quality. For the individual sheets Taback drew a series of terrifying figures taken from mythology, religion and popular culture: Medusa, a dragon (with St. George), Frankenstein, the Mummy, and King Kong. 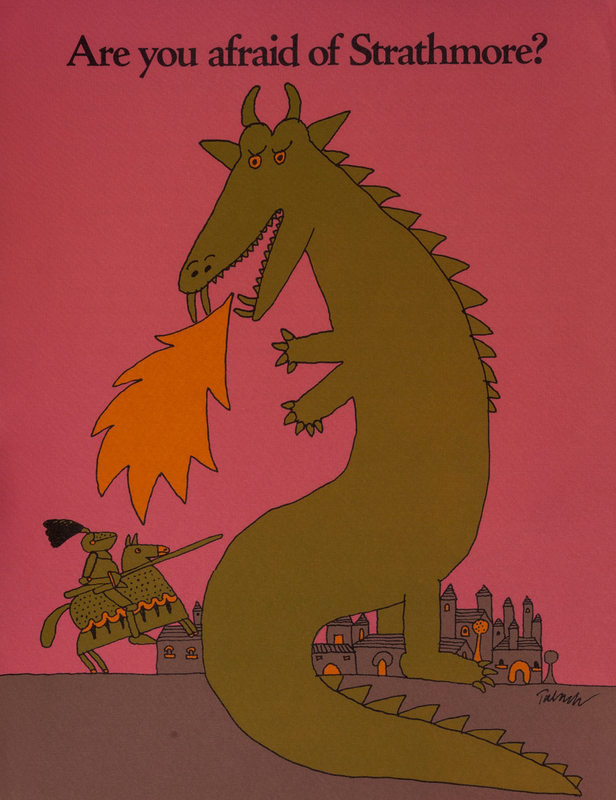 “Are you afraid of Strathmore?” St. George and the dragon promotion sheet (1968). Illustration by Simms Taback. 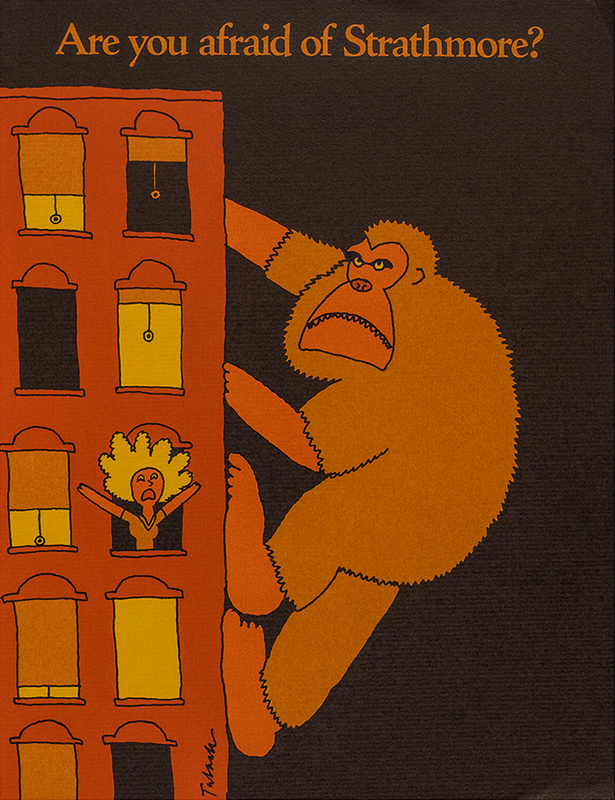 “Are you afraid of Strathmore?” King Kong promotion sheet (1968). Illustration by Simms Taback. Photograph by Vincent Giordano. “Are you afraid of Strathmore?” Mummy promotional sheet (1968). Illustration by Simms Taback. Photograph by Vincent Giordano. 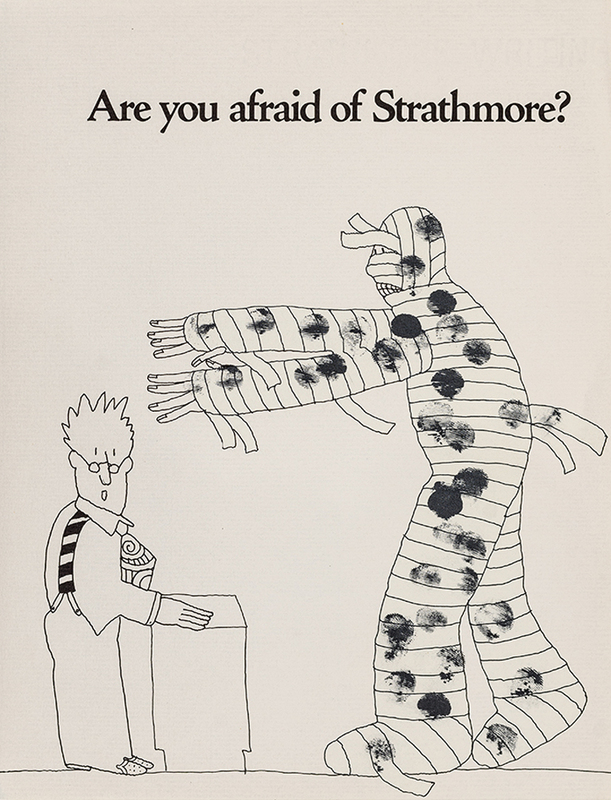 “Are you afraid of Strathmore” booklet cover (Strathmore Paper Co., c.1968). Illustration by Simms Taback. Photograph by Vincent Giordano. Inside back cover of “Are you afraid of Strathmore” booklet (c.1968). Illustration by Simms Taback. Page from “Are you afraid of Strathmore?” booklet (c.1968). Illustrations by Simms Taback. Not all of the printing tricks in the booklet involved folding and cutting. The “well-fed dog” shown above was “printed line and halftone on Basis 65 Fire Engine Red Strathmore Cover. His mouth is opaque white, one-impression offset.” Two color printing, but not as expected. Taback’s “Are You Afraid of Strathmore” campaign was followed a few years later by a similar one illustrated by Seymour Chwast. 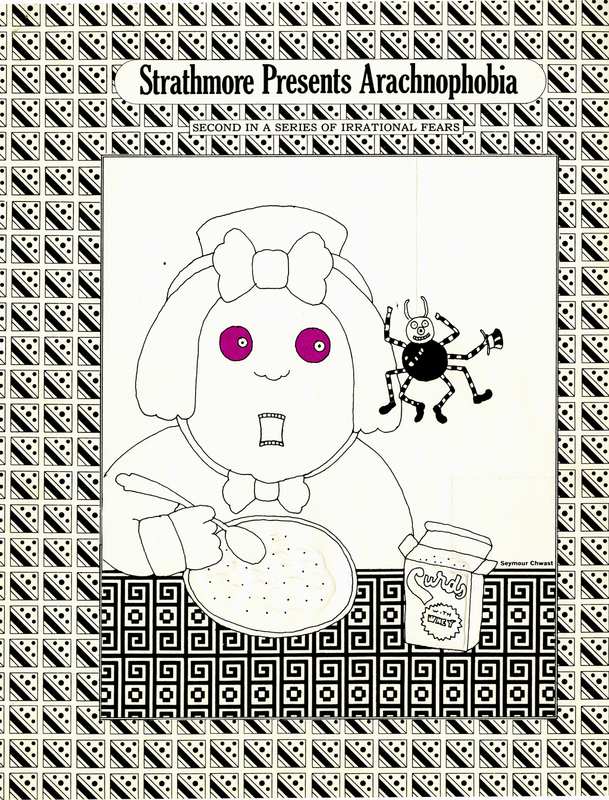 The Irrational Fears series (c.1970/1971) was also used as both direct mail pieces and magazine advertisements. Not much is known about the series since no examples exist in the Strathmore Archives at Mohawk. 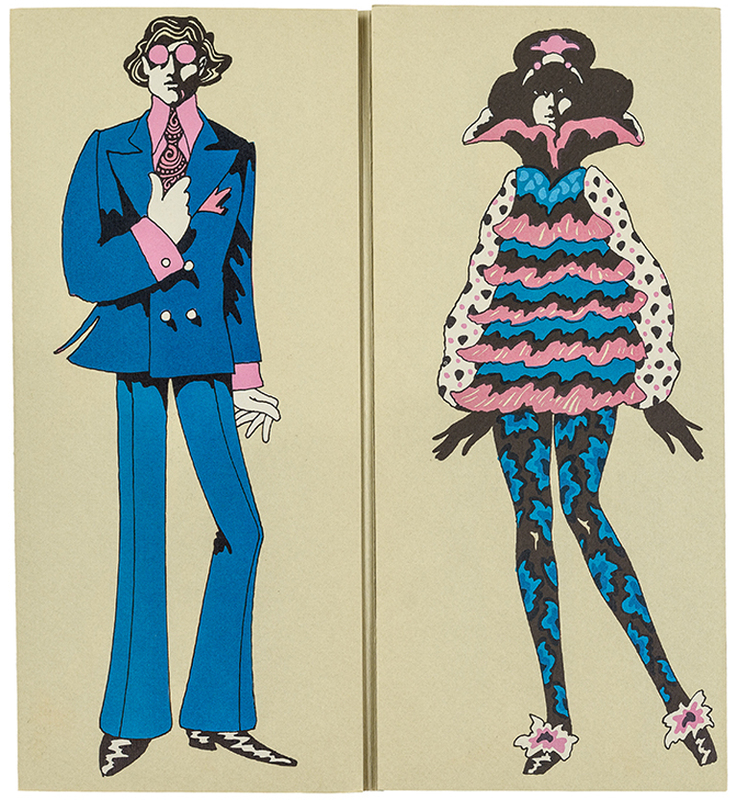 Fortunately, there are three sheets in the Seymour Chwast Collection at the Milton Glaser Design Study Center and Archives at the School of Visual Arts. 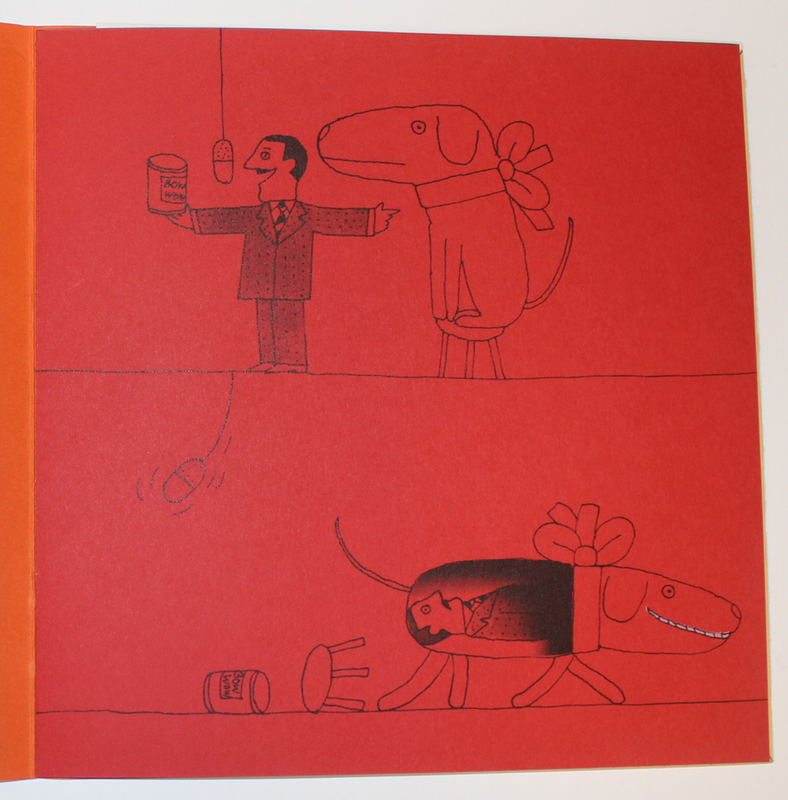 All three—quintessential Chwast in their illustration style, typography, and humor—are reproduced below in sequence. Were there others? Chwast doesn’t remember. Strathmore Presents Batrachophobia promotion (Strathmore Paper Co., c.1970). Design by Seymour Chwast. 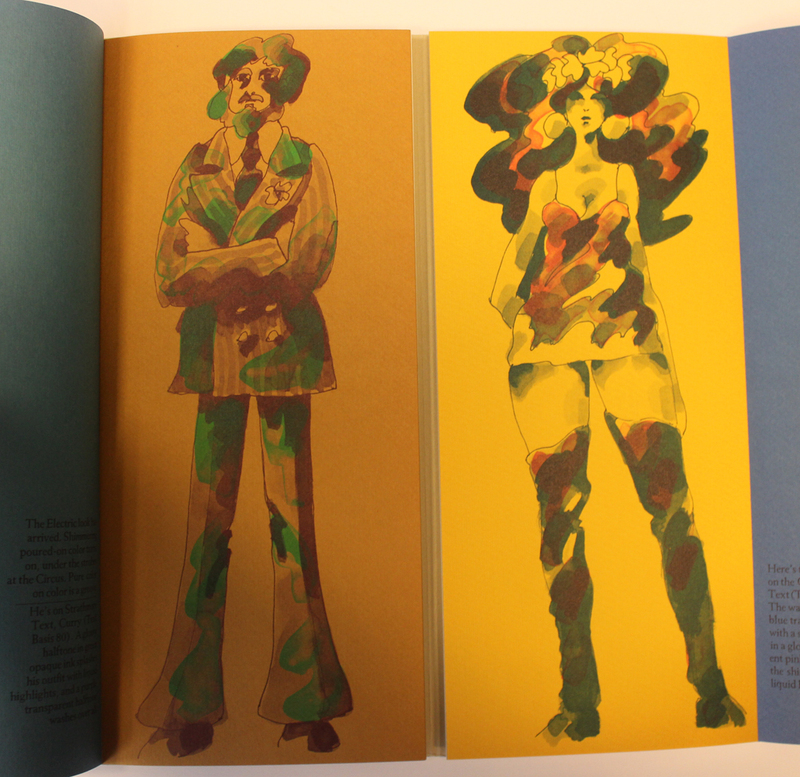 Image courtesy of the Milton Glaser Design Study Center and Archives, School of Visual Arts. Strathmore Presents Arachnophobia promotion (Strathmore Paper Co., c.1970). Design by Seymour Chwast. 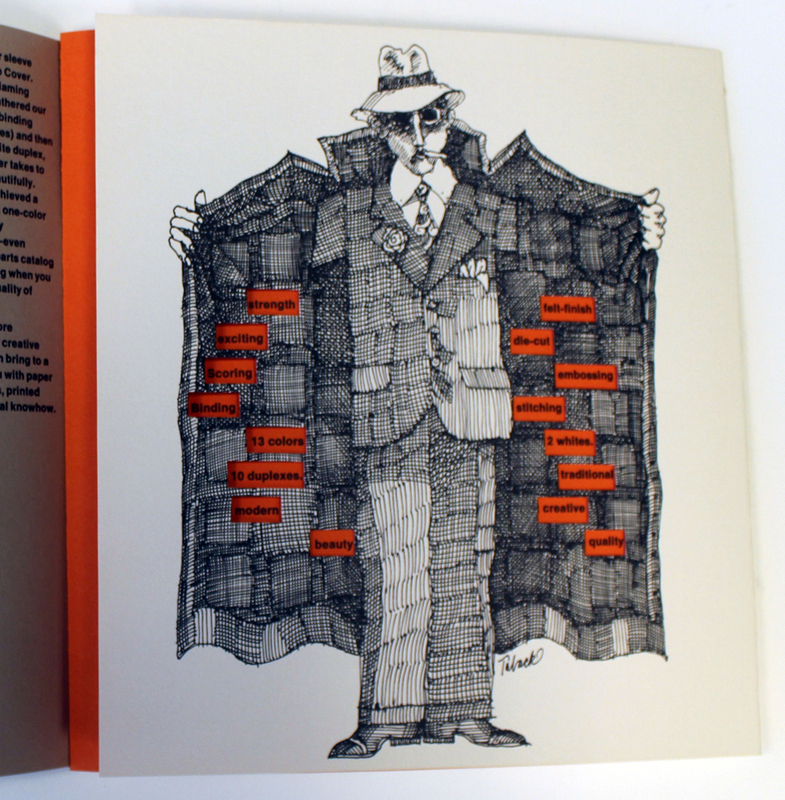 Image courtesy of the Milton Glaser Design Study Center and Archives, School of Visual Arts. Strathmore Presents Psalliotophobia promotion (Strathmore Paper Co., c.1971). 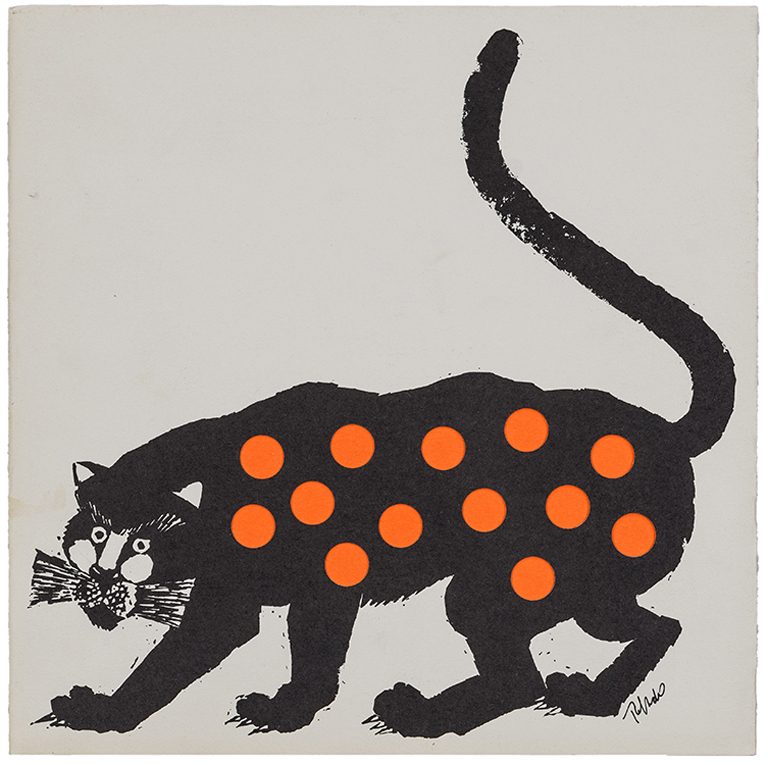 Design by Seymour Chwast. 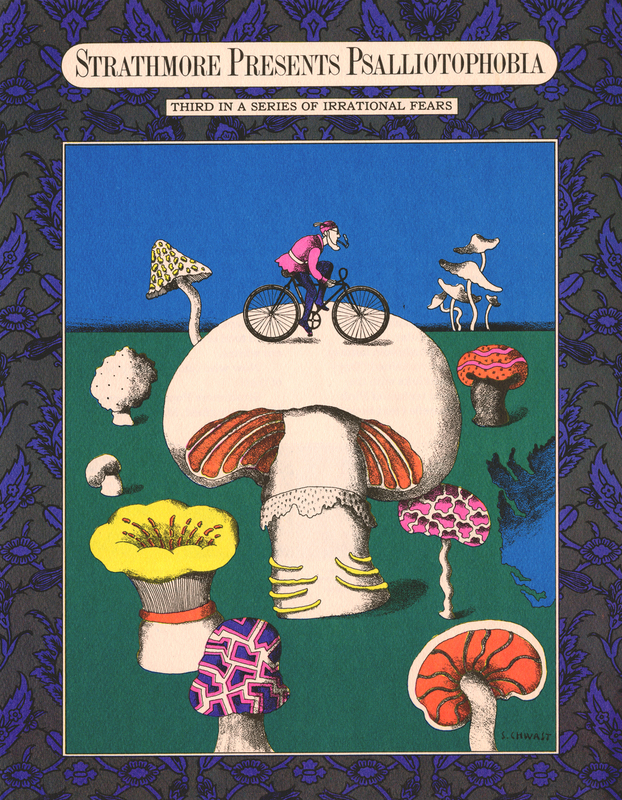 Image courtesy of the Milton Glaser Design Study Center and Archives, School of Visual Arts. The promotional work done by the members of Push Pin Studios and Simms Taback for Strathmore broke from the famous designer series of the 1950s in several ways. First, the portfolios stuffed with inserts were replaced by items that integrated the “samples” into a seamless narrative. Interactivity was added through paper engineering. Illustration, the strength of Strathmore’s heritage, was brought to the fore again. The introduction of wit and humor was new. Before the 1960s Strathmore promotions were usually beautiful, sometimes surprising, and often instructive. Now they were amusing too. Chris Harrold of Mohawk and I would be eager to know if anyone has other example of the Irrational Fears series or other Strathmore promotions from the 1960s.